The Ghana Meteorological Agency has warned of an imminent rainstorm, likely to hit parts of the country today [Tuesday] February 20, 2018. Some of the places likely to experience heavy downpours according to the Agency include Aflao, Ada, Keta, Accra, Tema and Madina. The rest are Cape Coast, Saltpond, Mankessim in the Central Region and Sekondi, Takoradi and Axim in the Western Region. “A Rainstorm observed on the south-eastern border of the country is expected to move west to affect the Eastern Coast this morning, and further move west to affect the Central and Western Coasts later in the day. The storm is expected to be preceded by moderate winds,” the statement added. 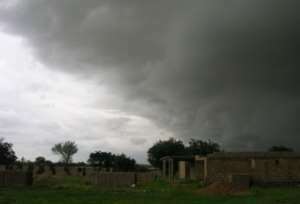 The Meteorological Agency said the storm will be experienced at varied times between 9:00am and 4:00pm. There are already some showers in parts of the capital with other places experiencing some thick cloud cover. A Rainstorm observed on the south-eastern border of the country is expected to move west to affect the Eastern Coast this morning, and further move west to affect the Central and Western Coasts later in the day. The storm is expected to be preceded by moderate winds. Places to be affected are as follows.